So here you will find some ideas of how to plan your days while in Madrid City Center. Where to go, what to see, eat and drink! Also we have gathered some typical costs of these activities. 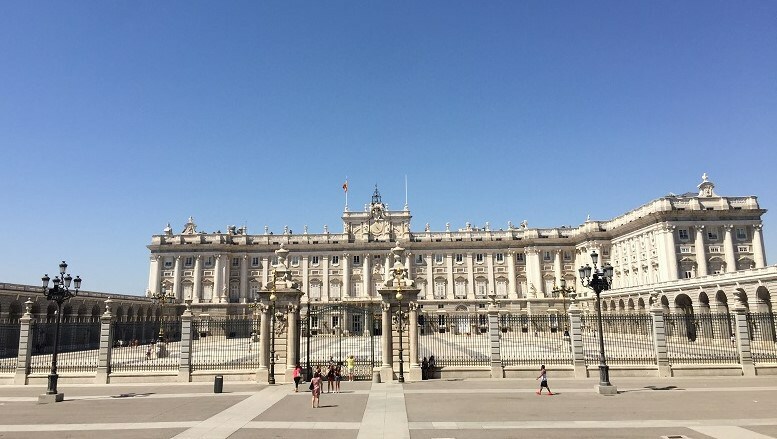 Activities: Puerta del Sol Madrid, Plaza Mayor and Royal Palace of Madrid. Food & Drinks: We tried churros with chocolate and bocadillo de calamares and we visited San Miguel market for some tapas and cold beer. Start from the imposing Puerta del Sol (metro station Sol) which is actually the center of Madrid. There are many sights to see. Most famous are the clock and the statue “the bear and the madrono tree” the symbol of Madrid City Center. New Year’s celebration is held on this beautiful square. Take the Calle Mayor Street and walk towards Plaza Mayor. Find Calle Coloreros on your right hand. Walk for 1 minute and you will find Chocolateria San Gines. Sit and enjoy a portion of the famous Spanish churros with chocolate (3,70 euros). After you eat the yummy churros take a walk at the busy Plaza Mayor. In the middle of the square you will see the statue of King Philip III, many shops and artists. Take a look and wander at the streets around. If you have an appetite for a Madrid snack go to “Museo del Jamon and grab a “bocadillo de calamares”, which is basically sandwich with fried calamari (2,50 euros). Now that you have some energy follow again Calle Mayor and walk down until you find Calle de Bailen (no more than 10’minutes). On your right hand you will see the Royal Palace of Madrid. Very impressive, overlooking the Sabatini gardens. Make a stop there. You can enter with a fee of 11 euros (no guide included) or just admire it from outside. If you decide to enter you will see the luxury of the royal rooms, some paintings, royal jewels and a Stradivarius violin. Take back the Calle Mayor and find Plaza san Miguel. You will see the Mercado de san Miguel which is basically a market where you can enjoy some tapas with a cold beer or sangria and rest. Start with a “green” mornig to the beautiful El Retiro park (metro station Retiro). Quite big park with many sculptures, monuments and of course a lake in the middle. You will see street artists and many events happening. Walk around and don’t forget to visit the Crystal Palace (Palacio de Cristal) and check the monument to Alfonso XII (is the one on the lake). If you like pic-nics here is the place to organise one! After spending some hours head to Puerta de Alcala. Probably you entered to El Retiro from there. Check the neoclassical Triumphal arch built on 1778 and then walk towards Calle Gran Via (metro station Gran via). This street is known as the spanish Broadway. You will see theatres, shops and malls. Head towards Puerta de Sol and then to Plaza Santa Ana or Plaza del Agel (next to each other) just 5 minutes walking from Plaza del Sol. Many people are eating and drinking outside especially during summer. There are many many restaurants and bars. Some suggestions: Laternal Santa Ana and Cerveceria Alemana (right on the plaza santa ana) for Spanish tastes and L’Artisan Furansu Kitchen (1 minute from the plaza) for Asian-French kitchen. Another interesting activity you can do there that will fulfil your appetite is a tapas tour which will cost you around 50-70euros through Viator. It is time for some Madrid City Center museums! The good thing is that they are almost next to each other. Start with the Prado museum (metro station atocha) next to the botanical gardens. The general ticket will cost you 16 euros (if you want guide-book is 25 euros). Also, is a good idea to buy the ticket from the web to skip the lines! Keep in mind the opening hours and if you can’t afford, check the free admission hours! Just click here! Get ready to enjoy some historic paintings and art work from Diego Velazquez, El Greco, Juan Sanchez Cotan, Francisco Goya and more. Next “too important to skip” is La Reina Sofiawhich is actually modern art museum. General entrance is 8 euros. Check again the opening hours here. The most famous art work is the Guernica from Picasso. You can also enjoy art work by Salvador Dalí and Joan Miró! Now if you can handle some more art go to The Thyssen-Bornemisza Museum. Here you can see basically paintings again from time periods that are not covered from the other two museums. The entrance fee for adults is 12 euros but there are many discount options for groups, young and old visitors! While you do all that museum wandering tour keep in mind that you should take a break between for some lunch! Near Prado museum (1 minute walking) you will find the Spanish farm (Calle Espalter 5). Dissent spanish food,meat and fish based, very yummy sangria. Average price per person 20 euros. Almost next is El 17 de Moreto (Calle Moreto 17). There we ate one of the most tasty salad with goat cheese and caramelized onions! Last but not least TIPS! Stay to Madrid City Center! You can enjoy easily the activities by foot. There are many beautiful hotels (hostels and Airbnb rooms too!). We chose Hotel Catalonia Las Cortes. Perfect location near Plaza Anna, free snacks and spacious rooms. Prefer the bus from the Barajas airport to the city center. It will cost only 5 euros (one way) and is about 40 minutes. Metro was more complicated and you will need to change lines. (Taxi is fixed tariff 30 euros). Drink tap water in Madrid, is perfectly safe!